The Clashers are members of a unique caste among the drakes. Their thick armor, while compensating for the drakes’ natural weakness against spears and arrows, is so heavy and restricting that they are not able to fly or muster enough breath to use their inner fire. They have embraced this handicap, completely encasing their wings to emphasize that they do not need flight to triumph in battle. 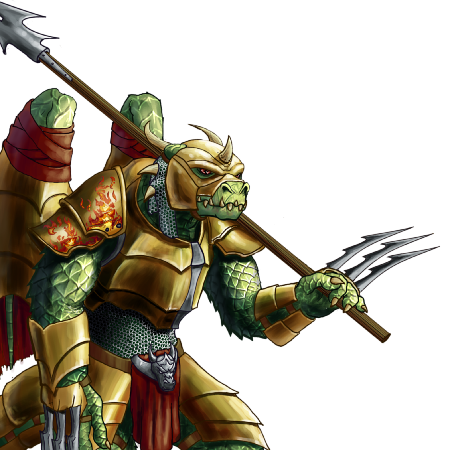 This is also the only caste that is allowed to break taboo and fight with spears in addition to the drake’s traditional metal claws, which makes them particularly good at "resolving" territorial disputes with other drakes and enforcing the laws of their tribe. Özel Bilgiler: Bu birimin silahının uzunluğu savunmada dahi olsa yakın saldırıda ilk vuruşu yapmasını sağlar. Last updated on Sat Apr 20 00:51:20 2019.